John and Sarah were married about 1866 in PA. Sarah was born 4 Sep 1847 at Woodberry, Bedford Co., PA and died 2 Jul 1906 at Vermontville, Eaton Co., MI. She was buried at Woodlawn Cemetery, Vermontville, Eaton, MI. Her parents were Edgar and Sarah (KAUFMAN) SMITH. The 1860 census shows John in Mifflin Co. PA. By 1870 John appears in the Juniata Co. PA census. By 1880 he was in Eaton Co. MI. 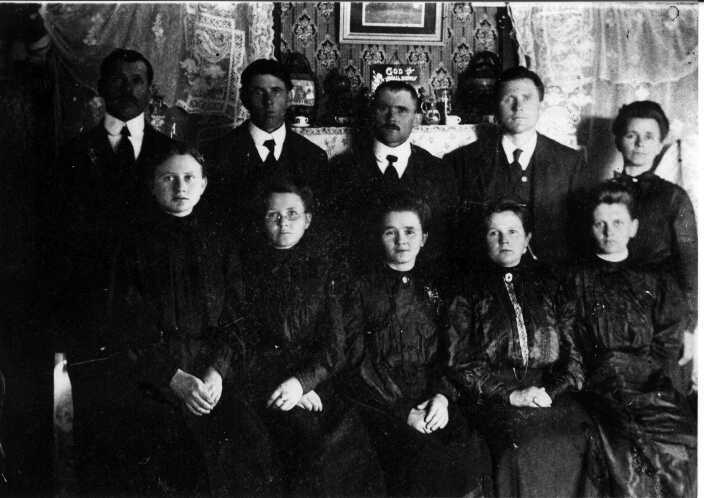 The Gearharts had eleven children, and they were all very hard working people. They were farmers and had 60 acres of sugar bush. A March 19, 1967 clipping from THE STATE JOURNAL of Lansing, Michigan relates a story of maple syrup and how it is gathered and made by three generations of Gearharts. Grandma's brother, Henry, lived on the home place until he died. His wife then moved to Nashville, Michigan. Their son and his wife, Fern, are operating the business with their sons, Glen and Karl, at the time this story was written. My memories of the maple syrup business are the yummy syrup on my pancakes when at Grandma's house, and also the sweet candy -- real maple candy -- sent to her from her old home in Michigan [Vermontville]. Mother visited there in 1964 and brought back this report: 'March 2 through April 10, we hung 3200 buckets and gathered 87,681 gals. of sap, which produced 2050 gals. of maple syrup. Our oil fired evaporator used 7712 gal. of fuel oil. The operation took 1900 man hours. We have storage for 5380 gal. of sap. In 1964 our trees averaged 27.4 gals. of sap per tap hole, which produced 2-2/5 qts. of syrup.' Needless to say, she was very impressed, as were we, when she described the business. Always in Grandma and Grandpa's kitchen was a shelf high on the wall holding a pendulum clock with a beautiful old face. As a little child, it was [a] fascinating thing to watch, as I sat at their breakfast table. Grandma told me it was an old clock from her parents' home. The story she told me about her parents' deaths, when I was old enough to ask about funerals (My parents attended so many of those in Kansas City, which I could not understand the meaning of. Grandma always kept Maxine and me the short time they were gone. Later years I realized why -- my mother [Eva Leona Winchell Davis] was the pianist for them. Grandpa Gearhart had come in from the fields and eaten a hearty meal at noontime. When he went back out to work, he crawled up on the top of the hay wagon to drive it to be unloaded. He suddenly toppled off the load of hay and was pronounced dead of a heart attack. The old family clock stopped at that time, never to run again, until sometime later, when Grandma Gearhart (Grandma Winchell's mother) died. I thought that a strange story, but a most fascinating one. In a sense, time stood still. Who knows why?? Only God. Notes for SARAH C. SMITH: Both Family Tree Maker Vol. 42, Pedigree #773 and Vol. 40, Pedigree #586 list the birth date of Sarah Smith as October 28, 1848 in Pennsylvania. The date of death is the same. Notes for Sarah Smith from both volumes (CDs) state the following: Written by: Hildred L. Figg (Kelsey) (Peabody): Sarah and her family homesteaded the land about 4 miles west of Vermontville on Scipio Road. She was the community nurse and midwife. The settlers called on her for help whenever there was an illness or accident. According to my mother (Ethel (Gearhart) Figg, she was the best cook ever. Comment: Alternate birth date of October 28, 1848 is given in two volumes of Family Tree Maker. John S. GEARHART an old and respected resident of Vermontville township passed away on July 1, 1903, the cause being heart failure brought on by the excessive heat. Mr. GEARHART was in McVeyton, Mufflin county, Pennsylvania, November 21, 1843, where he resided until 1875 when he came to Michigan, locating at Woodland where he lived for ten years, finally purchasing the farm west of this village upon which he resided at the time of his death. Those left to mourn his death are a loving wife and ten children. Ezra, John, Derwin and Henry, Mrs.. Amanda ROBART, Mrs.. Anna HARVEY, Mrs. Ella BENNETT, Mrs. Sarah WEEKS and Miss Edith GEARHART all of whom reside in this state and Mrs. Maggie WINCHEL of Kansas, also two brothers and four sisters who have their home in Pennsylvania. J. C. CLINGER, wife and daughter from Pennsylvania attended the funeral. Mrs. CLINGER being a sister. The interment took place in Woodlawn on July 5th. Diana ROCHE indicated that Barbara Ellen always went by "Ella." Sister Maggie recorded her as Ella B. in a Bible record. Also, census records indicate Magdalena vs. Magdelena spelling. 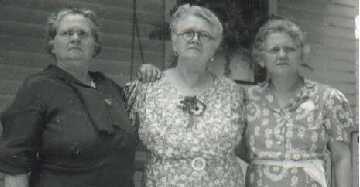 Front row: Edith May, Maggie, Anna M., Barbara Ellen, Sarah E.
Diana E. ROCHE (rochede@wt.net) is a great granddaughter of Maggie GEARHART WINCHELL, and she indicates this family were Pennsylvania Dutch (i.e. Deutch, or German) and were religious Dunkerds (or Dunkirds). The Dunkirds were a very strict sect similar to the Quakers. They wore very plain clothes with no fancy trim or embroidery. Margie and Paul CROCKER (m-pcrocker@worldnet.att.net) gave me some middle names and clarified the name order on the funeral picture above. Margie's grandmother was Amanda Martha.